The key with thrifting is to see something ugly and get a vision of what it could be. I have passed up many, many things that I thought were sooooo ugly and worthless then to find a week later coming across something similar on someones blog or pinterest. The once ugly thing was turned into something great. This has become a problem for me. I now think everything ugly can somehow be changed into something great. Which is why I have a garage FULL of “someday projects” It drives my husband crazy! But I do feel worse when I turn something down that could be great. I have now put a limit on my self if it’s in my garage for longer then 2 weeks I will never get to it. Which means sell or donate. Nothing is ever permanent which is fun and excited! Like My Desk I had a desk that I liked but now I have found something I LOVE with all my heart. Don’t get me wrong I don’t switch out my furniture that often but I have done it more recently. Projects can take a lot of time and energy so with that said only buy things that are worth your time and money. 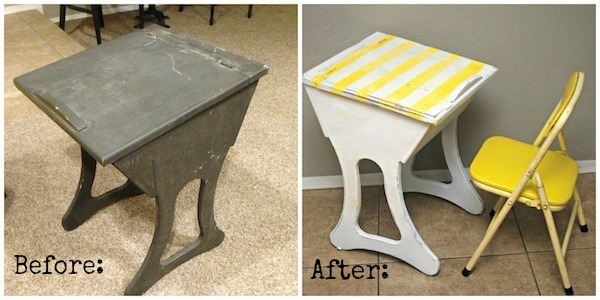 Don’t over-pay on a cheesy dresser or desk. Now on to my little quick project…. While thrifting I found this ugly old school desk that I knew was a diamond in the rough. My 4 year olds favorite thing to do is color and so I knew I had to have it. It was a steal too! I got the desk for a whopping $7 and the cute yellow chair for a $1 can’t beat that. 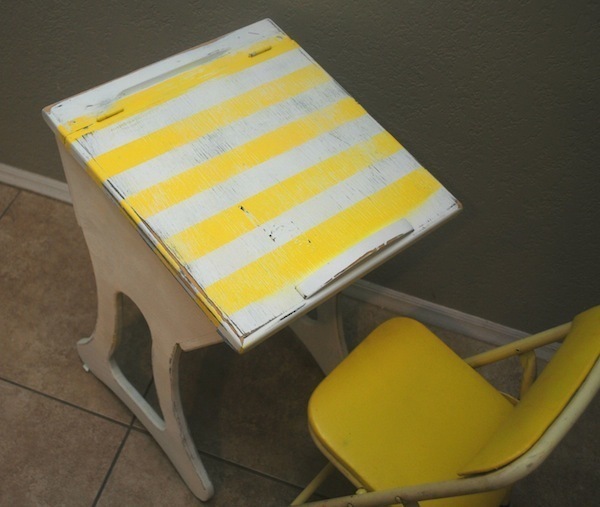 I used spray paint that I already had to paint the desk white then using painters tape I taped off some cute stripes for character. Then took some sand paper and distressed the whole thing. The project took maybe 30 minutes. My girls love it and I love that it matches my kitchen table and that her coloring books and crayons fit inside the desk. The Desk before was nasty brown and dirty but now its something that I feel is fun for my girls! Don’t be afraid of buying something ugly! If it’s cheap there is no risk in it! Also, before redoing a family heirloom go test out your skills on something cheap that won’t break your heart if you mess it up. Practice makes perfect. Go get something today and practice! That is really cute! 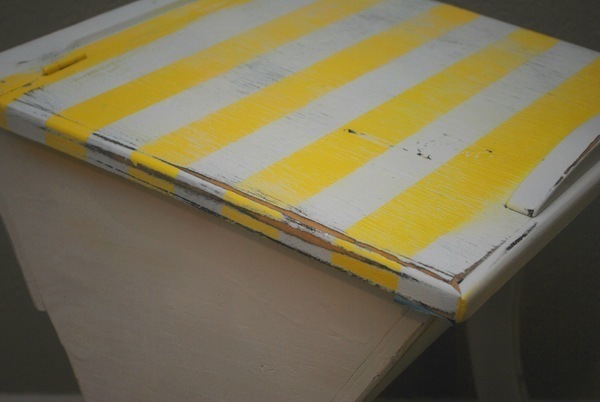 Love the bright yellow accent stripes. Isn’t it fun to turn an ugly duckling into a beautiful ( and fun ) swan?